Spanish Harlem, also known as El Barrio and East Harlem, is a neighborhood sandwiched in the northeastern corner of Manhattan that has historically been home to several immigrant communities. It is today one of the largest predominantly Latino communities in New York City and includes the area formerly known as Italian Harlem, which still harbors a small Italian American population along Pleasant Avenue. The neighborhood boundaries are Harlem River to the north, the East River to the east, East 96th Street to the south, and 5th Avenue to the west. The construction of the elevated transit to Harlem in the 1880s urbanized the area, and led to an influx of immigrants. In East Harlem, Italians predominated and the neighborhood became known as Italian Harlem, predating the better known Little Italy in southern Manhattan as the Italian American hub of the city. Puerto Rican immigration after the First World War established the first enclave of Latinos in Italian Harlem, and this small area became known as El Barrio. The area slowly grew to encompass all of Italian Harlem, as Italians moved out and Latinos moved in during another wave of Latino immigration after the Second World War. 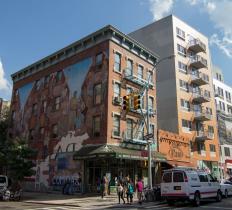 Since the 1950s, East Harlem has been dominated by residents El Barrio. With such an interesting history, it is definitely worthwhile visiting the neighborhood’s great cultural institution, El Museo Del Barrio, a museum dedicated to Latin American and Caribbean art and culture with strong community roots as a place of cultural pride and self-discovery. In addition to El Museo and the forthcoming Museum of African Art on Fifth Avenue, you’ll find a diverse collection of religious institutions in the area that reflect the neighborhoods interesting history: mosques, a Greek Orthodox monastery, several Roman Catholic churches, and a traditional Russian Orthodox church. Of particular note is the huge New York Mosque on the south border of Spanish Harlem at East 96th Street. Designed by the prestigious architectural firm of Skidmore, Owings, & Merrill and financed mainly by the Kuwaiti government, the mosque fills an entire city block along Manhattan’s Upper East Side. Also worth visiting is the primary business hub of Spanish Harlem, which has historically been East 116th Street from 5th Avenue heading east to the FDR Drive. Nowadays the 116th Street artery is populated by numerous taquerías and tamale vendors, creating a scrumptious cuisine convergence. A few streets away on 114th Street you can try to get seats for some fine Italian cuisine at the popular Rao’s. In lower East Harlem you might want to try some healthy servings of Japanese food at Ginger on 5th Avenue. Or maybe you’ll want to head to the heart of Spanish Harlem on 106th Street and visit the renowned La Fonda Boricua for hearty Puerto Rican stews, roasted pork, fresh cod fish salads and pan-fried steaks. When done dining, enjoy the northern reaches of Central Park after taking a walk along Central Park South. Given the mainly residential nature of Spanish Harlem, the neighborhood is lacking in many hotel accommodations. However if you are looking to stay close to El Barrio we recommend booking a room on the relatively nearby Upper East Side.